Stroll through the heart of Wisconsin Dells while sipping fine wines from around the world, spending time with friends, and celebrating all that Downtown Dells has to offer. Any profits made from the event will go to benefit the American Legion. 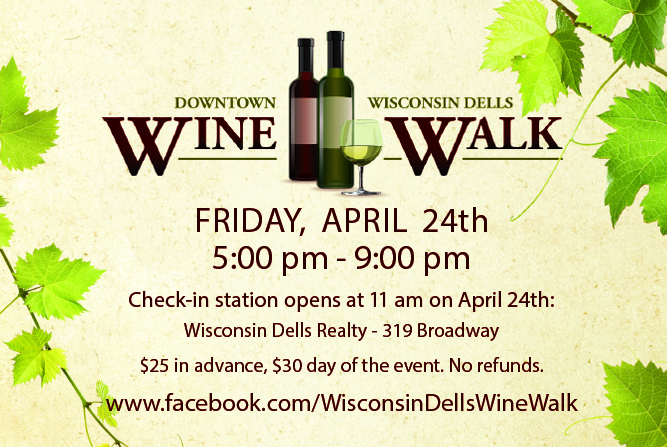 Start your evening by checking-in at Wisconsin Dells Realty (319 Broadway). Redeem your ticket for a souvenir wine glass to use for the event, along with a booklet featuring participating businesses and wines that will be served. The fun begins at 5 pm! Over 20 locations will be participating, allowing attendees to easily explore and enjoy all that Downtown Dells has to offer. At Wisconsin Dairyland Fudge, our Chocolate-Dipped Grapes will be back by popular demand and served along with other hor d’oeuvres to enhance the flavors of the Astica Malbec (Argentina) and Re Midas Soave (Italy) wines we will be pouring. Don’t forget to enter to win our FREE GIVEAWAY when you stop in! Sign up for our eNewsletter for a chance to win a handcrafted chocolate box with a mystery gift card inside ($25 total value of box and gift card). The winner will be announced on Monday, April 27.